We made ice cream. Well, I watched while ice cream was made. From goat milk. 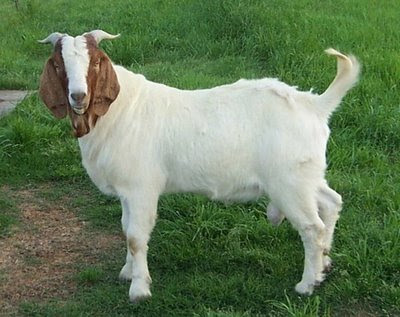 Yes, my acquantances milk goats. I don't ask questions. A dear friend is preggo (as in with child, not misspelled pasta sauce), and she abstained from the DIVINE dairy delight. "Crazy!" I cried. "So delicious!" I exclaimed. "You want some!" I declared. But then, in quiet, maternal wisdom she said "Actually unpasteurized milk can kill the baby." How does she know that? Is there a region in the brain that develops along with the fetus? The Mother Knows Best gray matter? I certainly hope so, because if ever there is a bun in my oven the poor thing is in serious peril. I'll eat essentially anything in front of me, not excluding food fallen on the floor that has far exceeded the ten second rule. Considering my current personal food pyramid, with diet coke as a foundation, microwave popcorn a step above that, then produce on the same level as el azteca chicken tacos, and chocolate in the top triangle (though really not consumed all that sparingly), I imagine drastic changes would need to take place before I start eating for any one other than myself. Lets all thank our lucky stars we're years out. I hear you can't eat raw goat with a baby either, why didn't you offer her some of that?? it's definitely a step above acquaintances.